Welcome back Honeybees for the second Weekly Buzz on David Archuleta! I want to take this opportunity to thank you for all your wonderful and positive comments on last week’s column! Your feedback was much appreciated! Now, let’s take another look at what David Archuleta has been doing this past week. Unless you live in Siberia or the Arctic Circle you heard the news. You say, What news! The News! THREE BIG WINS!!! We can all breathe in and out now! Pat ourselves on the back and say, we had no doubt because his fanatical fans watched his back! The Teen Choice Awards bring David the recognition he finally deserves in the music industry. We want to say from all his fans here in the United States and internationally, Congratulations on your TCA Sweep!! Spanish – Enhorabuena en su TCA’ concesiones de s! Tagalog – Maligayang pagbati sa iyong tatlong panalo galing sa TCA pagkalooban sayo. French – Swees TCA’ de David Archuleta, categorie de musique de s! Felicitations! Italian – Congratulazioni David sui vostri tre TCA’ Premi di S! German – Gluekwunsche David auf lhren drei TCA’s- Preise! The most divisive contestant from the seventh season of “AI.” David Archuleta is a Mormon teenage moppet with the apparent inability to speak in complete sentences, and the pop sensibilities of a middle-age man circa 1989. With his boyish looks though, Archuleta was a favorite of young girls and grandmas alike. Last year Archuleta released his self-titled debut, the awkward collection of soft adult-contemporary ballads his “AI” performances promised. David Archuleta was the only Idol finalist this year to sweep the Teen Music Awards this weekend. He walked away with Choice Music Breakout Artist, Choice Music Love Song for his single “Crush,” and the award for Choice Music Tour for his tour with Demi Lovato. David is currently working on a new Christmas album, set for release this November and on his second album. No word yet on when his second album will be released. NEWS UPDATE: Amazon.com – David Archuleta’s new album – Christmas from the Heart! Scheduled for Release on October 13, 2009 – The album pre-order has begun on Amazon and its moving up the charts very quickly. Go and pre-order today! 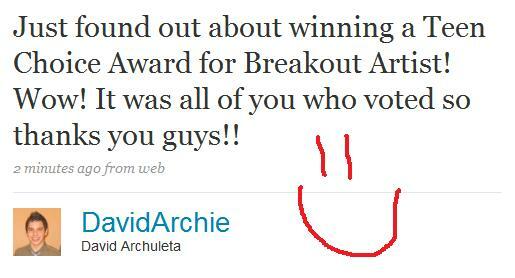 ACESHOWBIZ – David Archuleta won big at the 11th Annual Teen Choice Awards. The winner of “American Idol” season seven (they got it wrong, but he should have won, right Honeybees?) who didn’t attend the event brought home three surfboards in music field, dominating the music winners list. 13 August – Idol Headlines – NY Post – Paula Abdul gets offer from Idol. Australian Idol. She has been offered a deal to join the show! The Australians are serious about Paula – they put their request in writing. RadarOnline.com has learned exclusively. Posh Play for Idol Post? E! NEWS has learned that Posh Spice just joined staffers from the hit Fox reality competition aboard an American Airlines flight bound for Boston, site of this week’s round of American Idol auditions. Will she take the place of Paula Abdul? The rest of the judges—Simon, Randy and Kara—are already there. 11 August – David feels his struggle with his voice is a good learning experience. He appreciates what he is doing and feels blasting at every high note isn’t the most important thing. Day off in Nashville, had a writing session with Joy Williams, one of the writers on Waiting For Yesterday!…The other talented writers were Matt Bronleewe and Andrew Frohm (sp? haha. )…I also did some recording for the Christmas Album…I really hope you guys like the Christmas stuff! We’ve really been working on trying to have the songs be heartfelt and have that spirit of Christmas in them. Go and read David Archuleta’s weblog on his official site. It’s charming as usual. Just found out about winning a Teen Choice Award for Breakout Artist. Wow! It was all of you who voted so thanks guys! Got Carly’s number back. Woot Woot. Thanks for letting her know everyone lol. Done recording for the day. Gonna try and get some more recording in tomorrow. But now I’m hungry! In the studio booth right now. Haha….Woo hoo Christmas music! Minnesota! Why are you always so awesome! I felt like there was tar in my throat lol. but I still had such a great time! Thanks! So woke up without a voice today lol. But been on vocal rest and it’s helping! Just have to take it a little easy today Haha. My voice was almost gone by the end of the show but it lasted for the rest of it. Woo hoo!! Show was a lot of fun in Sioux Falls, SD. Just wanted to say thanks again to all of you guys for voting! Crazy winning 3 TCAs! gonna go to beedddd. Good night! Just steamed my shirt simply by boiling water in a kettle and using that. Sometimes you gotta work with what you got. Laid down piano on Archuleta trax. Headed back to home studio to meet choreographers. Standing side stage to see@davidarchie, and honored that he sang my song tonight. Just finished watching David Archuleta in Nashville. He’s awesome! Crush is my jam!! – Me and my girl at the show. Wasn’t exactly the best night performance-wise for me. Darn allergies and voice! Haha, But a lot of friends out at the show tonight! I’ve decided that I really like Nashville. Loved the time we spent here. Can’t wait to come back! Meet me in St. Louiiis Louiis Meet me at the faiir Haha. That’s where we are today! My ears have been popping all day. I think they should stop popping now. Have an ear-nose throat doctor checking me right now. Main problem is now just allergies haha. I figured. It’s Ashlee’s last day on the road with me. I don’t want her to leave! It’s been way fun with her though! P.S. I just found out that it’s National Left-hand Day. Go Lefties! I’m a lefty……HAHA. I survived!! My voice lasted to the end for tonight’s show in St. Louis haha. It’s feeling better though! Trying to rebook Ashlee’s flight……Haha. No one wants her to leave! Woo! Tonight’s crowd in Moline was so good. Can’t believe how loud they were! David had lost his voice and was on vocal rest all day before the concert. He still killed Works For Me! David sounded great and is truly a professional. Concert was amazing and you would never have believed he had lost his voice that morning. David’s good friend Ashlee sang with him, Lean on Me! It was very cute and you can tell they are very good friends. 10 August – Milwaukee at the Rave – After a 24 hour complete vocal rest David gave fans another great performance! David and friend Ashlee sang Lean on Me at the Rave in Milwaukee. 12 August – Nashville, Tennessee – David sang beautifully, but he felt it wasn’t one of his best performances. Little does he know even when he is not up to his personal standards he still is so much better than anyone else. 13 August – Taylor Swift attended Nashville show with buddies! 14 August – WOW is a new boy band who will be opening for David and Demi on August 20th and 21st. They are just starting to get noticed. I LOVE ALL ACCESS: Despite his sore throat David Archuleta pulled off a fantastic show; you continue to impress – Great job, David!!! Tony Orlando, singer-songwriter, attended the show and was totally singing along to Crush and taking a bunch of pictures. Moline, Illinois -I-Wireless Center – Amazing performance! He totally rocked the house! Everyone was Rockin out to Zero Gravity and the screams were loud! David Archuleta Singapore will be celebrating their 1 year anniversary on August 25, 2009. Happy Birthday! VIP Meet and Greet – David sang a verse of a bible song because he felt bad that he couldn’t sing. Very sweet! Took individual pictures and gave autographs since he couldn’t sing. Matt: “I’ve never lost sight of David’s uncanny ability to touch lives in his own innocent, unknowing way.” Very heartwarming! Worth reading! 11 August – examiner.com – Vote for your favorite AI runner-up: Clay Aiken, David Archuleta or Adam Lambert. At this moment David was ahead. Voting ends 11.59pm EST on Sunday, so VOTE NOW! 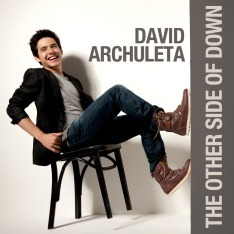 David Archuleta may not have won season seven of American Idol , but that hasn’t affected his potential as a teen idol. The fresh-faced 18-year-old, who released his self-titled debut album late last year, got some love from his young fans at last night’s 11th annual Teen Choice Awards in Los Angeles. 12 August- Archuleta Fanscene – What Disney song should David Archuleta sing? Interesting observation from fans about boundaries and proper behavior! Idol fan interactions at the bus sites and meet and greets have gotten bold and aggressive and Groping, especially with Adam and Kris and attempted kissing Kris while posing for a picture. “Some Idols have been avoiding the pre/post show mayhem because of the craziness and some fans have been lashing out at Adam etc on Twitter about it.” She goes on to say, “I was at the buses last year on a few occasions, and yes, sure it was loud and a bit crazy, but for the most part fans seemed to know the boundaries, especially with David Archuleta.” Is it because David never really had to deal with those situations? “Perhaps some of these Idols made the mistake of allowing things like that at first…deeming it harmless, and then it escalated.” She continues to comment that, “David made his boundaries quite clear. He was absolutely tireless when it came to autographs and fan interaction, but he dealt with fans in a way that reciprocated respect.” He didn’t respond to innuendo or crude comments, would not engage in anything he deemed inappropriate.” Please go and read entire posting. In response to her questioning whether David had to deal with those situations, yes I have personally observed David being asked to do things that were not within his boundaries and he handled them with poise and respect. He stated quite honestly on many interviews what he considers not appropriate. I recall the proper zone area on someone he would only autograph on and many times by hand gestures map it out. There were hugs from older women that lingered a little too long. The Kansas City TV news reported that one woman “couldn’t keep her hands off David.” David handled these incidences with poise and charm and with a nice “no, I can’t” at times. David knows that 99% of his fans respect him and his morals and would not intentionally embarrass him. Many times he has stated many other artists tell him how nice and polite we are and how they really think his fans are great. He thinks so too! I believe fans represent the character of their idol and David’s is above reproach! 11 August – Filipino International singing sensation Charice Pempengco has recorded on David’s Christmas album! Duet? Can’t wait for this album to come out in November! Which “American Idol” alum is champ? We’ve got a top 10 list…So who are the real heavyweights in the post-”Idol” camp? Well, here’s one ranking — a top 10 list that takes into account such things as record sales and radio play, as well as an artist’s current spot in the industry and projections for further success. 10 – David Archuleta (Season 7) – In the “real world” battle of David vs David (runner-up Archuleta against champ Cook), the sales figures mirror the voting result. Cook’s debut has gone platinum, Archuleta’s has been certified gold. 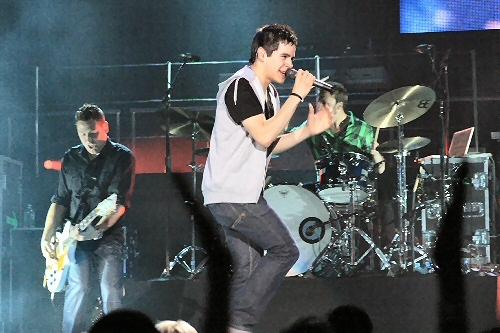 Yet, Archuleta showed with his smash single “Crush” that he might have more to offer in the long run. Very interesting ranking and with the exception of one, all the rest have had more time out as a recording artist than David. I don’t necessarily agree with this ranking and it would be interesting to find out if this article was written before the TCA Awards. As much as he has commented on David having more to offer, Mr. Harrington’s opinion may have changed since the announcement of David winning for Breakout Artist, Love Song (Crush) and Tour, and his ranking may have moved up some. What is even more interesting is that Cook does not show on this top 10, interesting but no surprise for me. We all would like to see David at #1, and he will be very soon, but to have him even ranked in the top 10 is very exciting and holds such promise that his music will be around a very long time. Pikepss! You have really worked hard on this post and I enjoyed every bit of the news and the way that you reported it. I will look forward to your weekly buzz wrap from now on! Isn’t David a wonderful fantastic person! Excellent recap Pam!! great job! I love hearing about how busy and exciting his week is, it always make mine seem boring in comparison. haha. I am so proud of him!! Congrats David on the 3 TCA’s!! Thank you for taking the time to keep such detailed records every week! I hope you know it really is appreciated – I tweet this to my followers so I can keep it for my easy access! Thank you, again! hey Pam, great job again this week! Even with your travel plans, you managed to do a superb job. I’ve finally got a Twitter account for DA Buzzing, (thanks again, Kathleen), so every week, I’ll be sure to Tweet your Buzz Wrap.